If it Ain’t Broke, Why Go Broke Buying A New One? I’m a person who eats, lives and breathes all things creative. Okay, maybe not eat because that’d be a bit odd but you get my point. 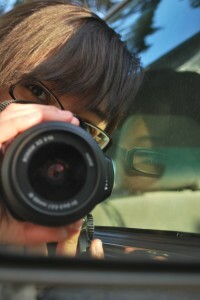 One of my creative indulgences has always been photography. Cameras, particularly the type I like to work with, aren’t exactly cheap. I currently own a Nikon D-60, which by 2012’s standards would be considered outdated. What are they up to now, the Nikon 25,000? I’m joking of course, but Nikon has added a ton of new models to their line up since I first got my little D-60 about four years ago. The little Nikon that could. If you’re like me and enjoy the arts and photography in particular, you know that sometimes there is a need to keep up with the changing technology in photography, only if you’re a total tech head. But if you indulge in the simple pleasure of creating art with a camera, there are tons of ways to tickle your every photographic whim while sticking to that college budget. First, don’t go selling your car just to buy the latest camera model. You know for a fact that in another six months or so, the company is just going to release yet another, fancier version of the ‘latest’ model so don’t waste your money; it’ll only lead to heartbreak. Instead of spending the money you originally planned on using to buy that new model, spend the money on pimping out the camera you currently have. For example, instead of buying a new camera for my little D-60, I instead opted to upgrade my lens. Now, my pictures are just as great as those that are taken with a D-5,000. 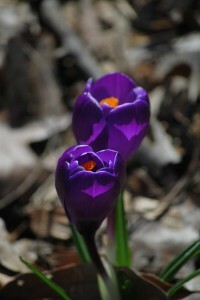 A new lens enhanced the quality of my photos for way less than the price of a new camera. 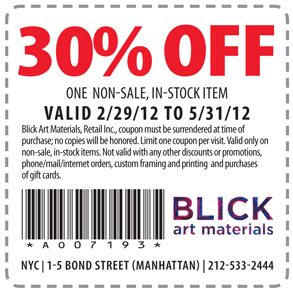 Another great way to further your endeavors in photography is to shop around vintage stores for old film cameras. If you have any knowledge of darkroom photography, this can be a great way to take your photography to the next level. In today’s tech savvy world, it’s rare to come across a photographer who actually knows how to work with film. However, if you have no prior knowledge of film photography but have the time and patience to learn a new skill, buying a cheap, used film camera and learning on your own doesn’t hurt. And what do you do if find yourself with a broken camera and face the temptation of filing for bankruptcy just to buy a fancy new camera? Fix it! It’s way less expensive to fix a used camera then to buy a whole new one. However, if you truly want to buy a new camera, at least go through less expensive sellers like Ebay or Amazon rather than big name stores where they jack up the prices. 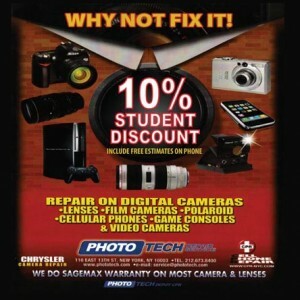 To save a bit of money getting that broken camera fixed, be sure to use this student discount and look for other student discounts when purchasing any electronic items. Remember, it never hurts to ask! Cabin in the Woods: You think you know the story? I saw the trailer for this movie a month ago and it started as any other horror movie would start: A bunch of young people going off into the woods only to later be murdered by some unknown monster. Typical and predictable. Then in the middle of the trailer words appear in an eerie white font, “You think you know the story?” and I thought to myself, “Yes, I do think I know the story but prove me wrong because now I am interested.” What they showed next was a mixture of flashing images of force fields, monsters, blood, people screaming, things twisting, stuff turning and finally what really won me over was the name of the writer: Joss Whedon. I am a big fan of this man’s work. He wrote Buffy the Vampire Slayer, Angel, Firefly, and several X-men comics. He is a talented writer who can really perfect characterization and take typical concepts and twist them into an extraordinary experience. He also has a quirky and sometimes disturbing sense of humor. Onto the movie itself, Cabin in the Woods was AMAZING. The movie tricks the audience into thinking they know what is going to happen and then the movie morphs out of your expectations creating an environment of thrills, suspense, and excitement. The movie switched between moments of complete comfort of knowing what was happening to the group of protagonists, moments of complete horror, and moments of oddly placed humor which adds to the disturbing effect Whedon creates so well. The movie overwhelmed my expectations. Yes, a lot of parts of the movie seemed obvious such as the old man warning them that they won’t be able to get back, the characters being foolish enough to play with items and read out demonic latin words that lead to blood and sacrifice. Yes, that is a bit cliche and not hard to predict. However, it is not a movie that takes itself seriously. It is fun and meant to play with the audience with its campy spirit. The acting and characterization were perfect and the twists either scared me (like they should have), shocked me, or a combination of the first two followed by spontaneous laughter or disbelief at what was going on. Also, there is a suprise guest at the end, though not everyone would know or appreciate this addition. I have come to a conclusion that Joss Whedon never dissapoints and that this movie is given the rating of AWESOME. Go see it for yourselves if you don’t believe me. Don’t look for spoilers though. That just ruins the entire movie. For after movie munchies, remember to take advantage of student discounts and the great offers at Campus Clipper. One of the greatest things (which also may be it biggest flaw) about New York City is that it is full of many different kinds of people. Maybe it’s the loud cacophony of vehicles and conversations, we cannot deny how the city is just inherently full of loud people. While not intended, we have all come across a situation where we may have overheard a conversation someone else was having with their friends, perhaps on the phone, or maybe even with themselves. Nevertheless, even though we are trying to sleep on a train and hearing the murmuring of our neighbors makes us create our own threatening murmurs in our head, sometimes you come across interesting conversations. Last week, I was on the train, coming home late at night from a class, and had the lovely luck of sitting next to a big man eating burgers and talking loudly to anyone who would hear. While I usually ignore people on the train, I could not help but hear and listen to what he was sharing. He talked about a woman who he considered the only person he could trust and that he no longer travels to a certain area because a fight broke out and he got shot there. Even if it was just the tall tale of a man desperately seeking attention, it was interesting and slowly I transformed the story he told to the train inhabitants into a movie in my mind. He began getting repetitive but then he mumbled how you can’t trust anyone and how nowadays people aren’t afraid to backstab you and shoot you without remorse. Yes, very morbid things I overheard, or maybe he was just oversharing, but it depends on how you look at it. Here was a man who had learned a very harsh lesson and was telling it to anyone who could hear. In one train ride I learned a personal secret and lesson from a complete stranger. Ending note? Listen to others and what they say. You don’t have to intently listen in to strange homeless men but don’t reject a person’s words right away as soon as they seem a little crazy. Take their words with a grain of salt because it is how you view the world that changes how the world affects you. But not everything you overhear has to be morbid. In a complete change of tone, Overhead Everywhere is a hilarious site containing overheard conversations all over the country. It has mature language and content but all in all, I find myself skimming through these pages for a good laugh every so often. If only when I went out, I could keep track of things I overhear. It’d make great fodder for stories or sharing with friends. 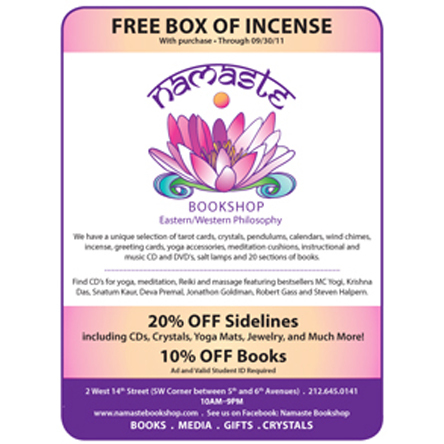 You could use your money to get a digital recorder or even simpler get a fancy notebook with a student discount at an art store. The possibilities are endless when your ideas come from crazy New Yorkers. But finally, I got a chance to visit this place. The front was empty when I walked into the restaurant but the back was where most of the customers were seated. It was cozy with wooden walls and warm lighting. I went in the afternoon around 3pm so there weren’t a lot of people and I received plenty of space and attention without noisy neighbors. As soon as I sat down, I already felt at home. The dark wood tables were a lovely touch to the whole “cozy tofu house” feel. It didn’t take me long to order. I automatically knew I did not want my usual bulgogi or kalbi anything. 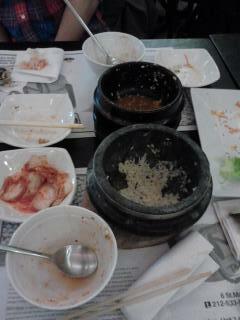 Everytime I go to a Korean restaurant, the safest thing for me to order is the bulgogi. 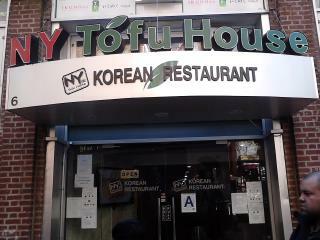 Seeing as this is a tofu house, I definitely had to order tofu. For the appetizer, I got the Monkey Balls (yes, because the name caught my attention) and the Seafood Jigae (or Tofu Stew). While waiting I noticed that they had the most adorable chalkboard displaying their daily specials. I want a chalkboard in my house now. 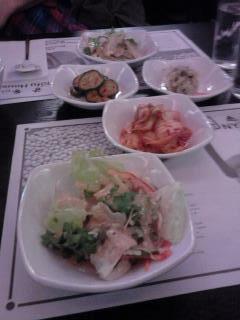 The banchan was three dishes instead of the usual five or six I have had at most restaurants. I’ve heard that Yelp reviewers were very dissapointed at this. Honestly, it didn’t bother me that much. I’ve gone to places that give you 5 little dishes and I’d only eat from 3 of them anyway because the others tasted a bit off. Though I really wished they had the potato salad one. The salad was a pleasant little surprise for me. I expected it to have one of two typical sauces: either the usual orange sauce usually seen in Japanese restaurants or a bland diluted oil and vinegar sauce that tastes nothing short of a dish of leaves and water. Instead, this salad had some sort of peanut sauce that tasted surprsingly good with the salad. Lettuce never tasted so good that wasn’t in Caesar or Italian. Looked too good so I ate one before taking a picture. I put this in caps because I am born in the year of the monkey in the Zodiac system and am partial to hilarious names involving monkeys and food. In other words, I couldn’t resist. Tiny sized balls were presented before us on a plate. 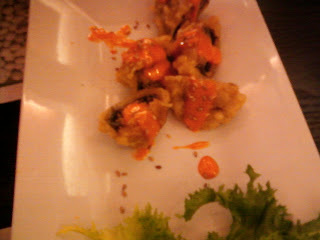 Fried, delicious and the slightly tangy yet spicy orange sauce drizzled on top made it almost perfect. My only problem was that there should have been more since the dish was a tad pricey in my book. A small little black pot of bubbling tofu and another pot of smoking rice. Such a cute pair. The tofu was mildly spicy (just the right amount spice and temperature for my sensitive taste buds). There were two shrimps (still shelled) and two clams. I did not mind the small amount, though I’d prefer my shrimp without the shell please. Unless that is some Korean tradition I am unaware of. 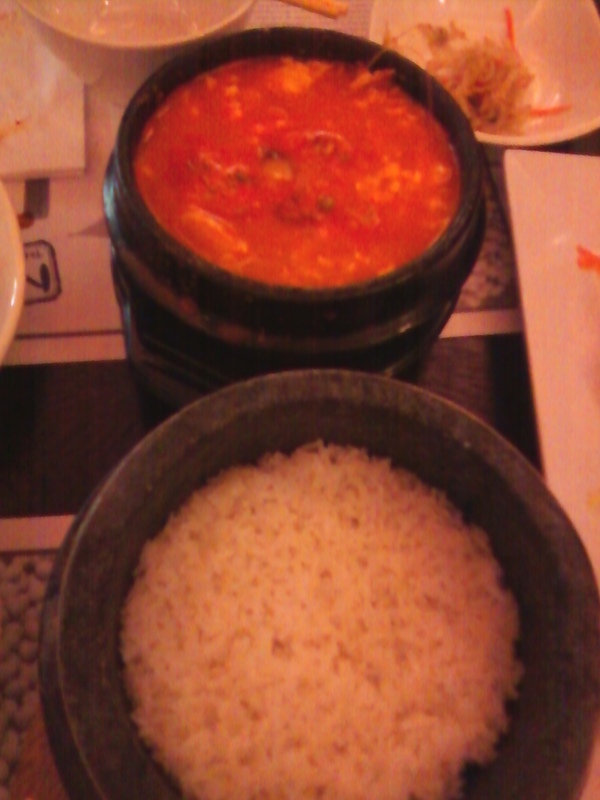 The tofu stew itself had a nice light seafood flavor to it. In short, I finished everything. Gone to very last drop of stew and bits of rice that I couldn’t scrape out of the bowl. The portions were perfect. I do not like coming out of a restaurant feeling over-stuffed and this left me feeling satisfied and warm. The waiters were friendly when I asked for water, rather than some places where waiters don’t even offer a smile. I would suggest lunch time personally since I don’t like overcrowded environments, but I do like it when the store has people in there. I hear they do not have their liquor license yet so sorry, no late night Korean food and booze gatherings (just the Korean food). Also, I found that the stew was very well priced (around 8 bucks) but the Monkey Balls were more than a normal appetizer price. Savings can be life savers. 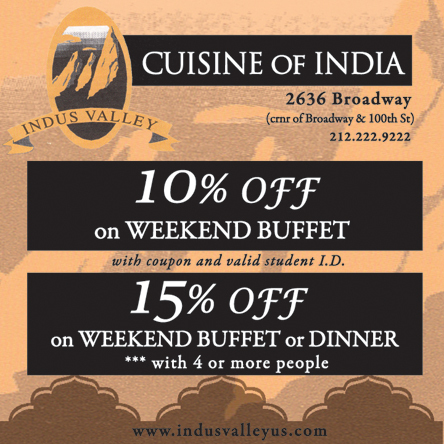 You can use this student discount to save money while enjoying your Korean food. It has been said that, it takes ten thousand hours of practice to become an expert in anything. So if you want to be an athlete or you want to play an instrument, or write, it will be a matter of constant practice; repetition, repetition, repetition. I came to personally understand this concept when I became an intern at the Campus Clipper. I’ve always wanted to write, but I didn’t always sit down to write. And despite the fact that I’ve read several on writing books, I struggled with that discipline. Among the many valuable skills I’ve learned at the Campus Clipper, this idea of constant practice is one that I have come to hone; thanks to Cassandra Fox and her genius plan. I come into the Campus Clipper for a few hours and after I catch up on the logistics and the emails, I stare at the blank screen for ten minutes. I remind myself that I have to blog. So I write that first sentence. The first few sentences are usually bad but it leads me to something. And before I know it, I can’t stop my fingers from typing away. After a couple of weeks I realized how much material I produced. It triggered something in me; it unleashed the beast that was the cause of so much procrastination, fear, and lack of discipline. Knowing that I have two hours to write when I’m here and sitting down to the task, has really been a tremendous help to me. I’m now committed to the practice of writing; I’m committed to that daunting task of staring at the blank screen for a few minutes and writing the first bad sentence, because that’s what it takes for the rest to come. Another important part in becoming a writer is reading, reading, reading. 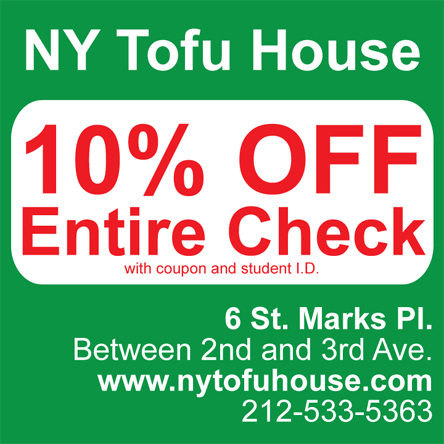 Follow the Campus Clipper Bloggers and check for student discounts to bookstores, restaurants and entertainment in NYC!